You will be given a Free reference e-book to read which has 614 pages And the test will be based on that e-book. A CCNP (Cisco certified network professional) TSHOOT certification works by validating the ability of a specific professional to implement, troubleshoot, verify and plan wide and local area networks while also collaboratively working with specialists on advanced voice, video, wireless and security solutions. It should be noted that in order for you to easily pass this certification, you are required to have a strong understanding about everything related to troubleshooting issues faced by a network. It is also important for you to understand everything about a network and the most useful technologies that you can use to troubleshoot any issues. The certification also addresses best practices linked to troubleshooting various technologies including wireless, voice, switching and routing. Passing it requires a more comprehensive understanding about a set of topics that focus on switch and routes. You will also have an easier time passing the certification exam if you have a stronger grasp about the fundamental concepts that surround mechanisms for QoS or quality of service that now forms part of Cisco routers. This is a huge help in recognizing voice traffic. 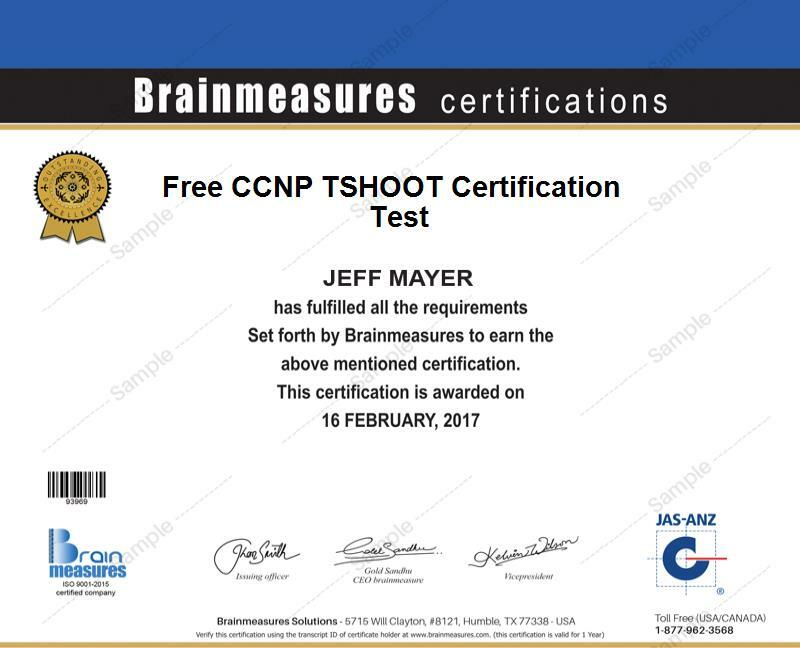 Fortunately, the whole process of trying to pass the CCNP TSHOOT certification is now easier because Brainmeasures is around to provide you with a free CCNP TSHOOT practice course. This free practice course is truly remarkable because aside from the fact that it is offered by the most reliable online certification company at present, it also comes with a free study course and practice test that are vital in preparing you towards passing the certification exam. The free CCNP TSHOOT certification practice course offered by Brainmeasures is the most ideal online certification course for you if you dream of holding a CCNP TSHOOT certification. What makes this practice course truly remarkable is its effectiveness to also provide you with a free study guide which is detailed enough to help you understand everything related to troubleshooting issues in a network as well as the scope of your duties and responsibilities as a Cisco certified network professional. With the help of its free study course, you will have an easier time understanding all aspects that are covered in the CCNP certification exam including the most common tasks and tools used for network maintenance, the most effective troubleshooting models, route redistribution, router performance and security troubleshooting, large enterprise network troubleshooting and IP communications and services troubleshooting. A free practice test is also included to further prepare you towards the actual exam and increase your possibility of passing. How to effectively restore operations after they fail? The CCNP TSHOOT certification practice course which is now offered by Brainmeasures is proven to be appropriate for all those who wish to easily pass the CCNP TSHOT certification exam. It works ideally for network professionals, support engineers, network and systems engineers, network technicians and all other professionals who want to further improve their skills in independently working on the most complex solutions for a network. Successfully passing the CCNP TSHOOT certification exam can also boost your chances of earning a higher salary. With the help of your certificate, working as a network support engineer will become easier and this will entitle you to receive an average of $89,000 yearly. You can also work as a network consultant which gives you the chance to receive around $74,000 to $116,000 per year.